With over 20,000 genes, 200,000 proteins and thousands of pathways, you can't measure everything in a cell at once, but you can measure the energy that drives them. Agilent offers cell analysis technology solutions that detect discrete changes in cellular bioenergetics in real-time. Real-time cell measurements provide a clear window into the critical functions driving cell signaling, proliferation, activation, toxicity and biosynthesis. Move beyond analyzing what your cells are, and reveal a clearer measure of what they do. 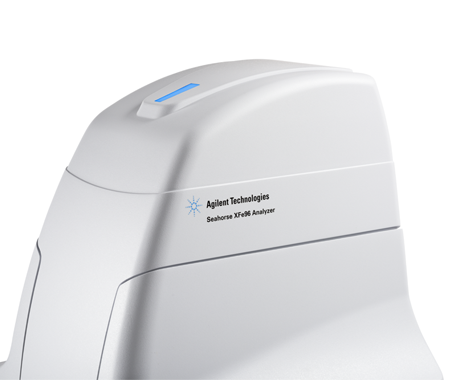 Agilent offers two platforms for studying cell metabolism. 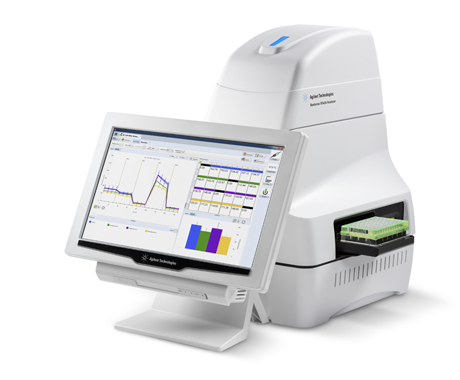 The Seahorse XF platform is a label-free, integrated platform that seamlessly combines instrument, sensor cartridge, assay kits and software to deliver quantitative cell metabolic data with real-time compound exposure kinetics. 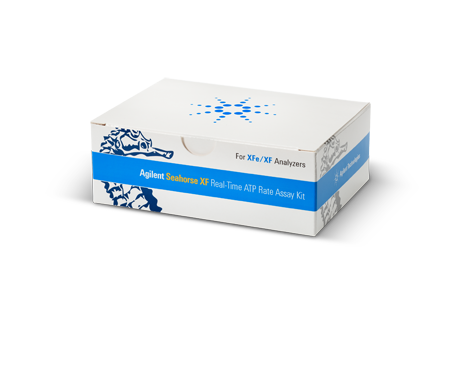 Agilent also offers soluble sensor assay kits, MitoXpress and pH-Xtra plate-reader ready options in a flexible format, ideally suited to high throughput assay applications. 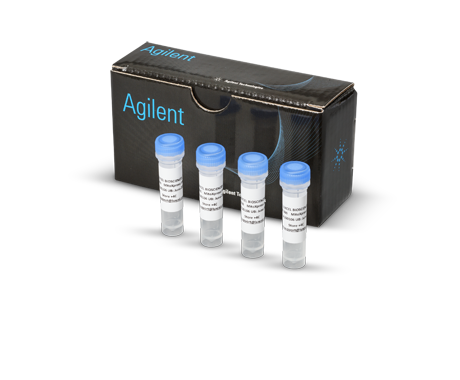 These plate-reader ready options are designed in a flexible format to accommodate all low to high throughput assay applications. Select the right cell metabolism platform for your application. Agilent has many standard assays built on oxygen and pH sensor technologies to help you to address your research needs. Measure ATP production rates from glycolysis and mitochondrial respiration in live cells. Quantify metabolic switching. The gold standard in mitochondrial functionality, providing basal respiration, ATP-linked respiration, maximal respiration and spare respiratory capacity. Get a complete profile of cellular glycolysis. Quantify glycolytic rate and pathway capacity. Understand cell fuel/substrate metabolism from three fuel sources. Identify preference, flexibility and fuel liability. A unique, powerful tool for the quantification of real-time cellular oxygenation, revealing the interplay between cellular oxygenation and metabolism. The Seahorse XF Assay Learning Center provides protocols, techniques and resources aligned to each step of the XF workflow to ensure optimal assay performance and results. The XF Assay Learning Center has been recently updated to reference the new Seahorse XF Real-Time ATP Rate Assay for performing initial cell characterization. 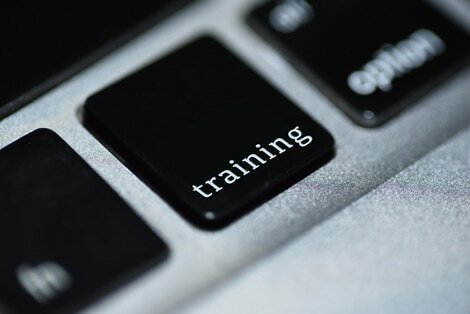 The XF Assay Learning Center provides the most up-to-date information on protocols and procedures for preparing, running, and analyzing an XF assay. Understanding which Agilent cell metabolism assay best suits your biological questions, workflow, and throughput goals. 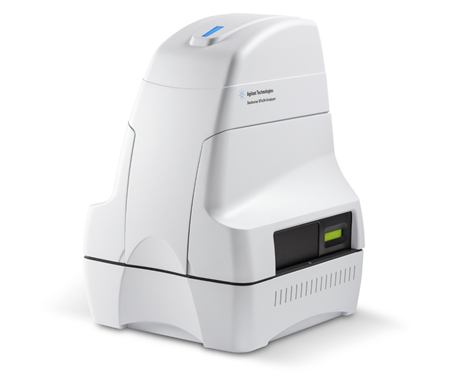 All Seahorse XF instruments analyze mitochondrial respiration and glycolysis in live cells, generating data in just minutes. Seahorse XF technology uses solid-state sensors to simultaneously measure both oxygen consumption rate (OCR) and extracellular acidification rate (ECAR) in every well. Demonstrating how the XF Technology works and how it is being used. Focusing on a wide range of topics. Search the list of Agilent Cell Analysis publications by research area, cell type, cell line, xf assay and author. Browse the full list of publications using Agilent Cell Analysis data. Find the right instrument for your workflow and throughput, the right assay for your biological question and interpret results with our powerful software. Agilent offers three configurations of XF Instruments, depending on your throughput needs and sample type. 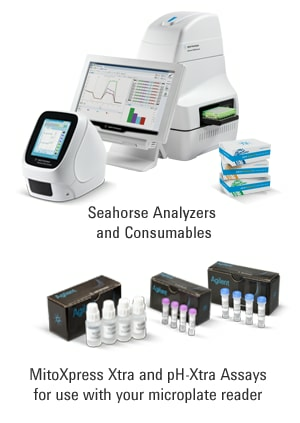 Easy to use assay kits, FluxPaks, media and reagents simplify Seahorse XF Analysis. Search by instrument type. Design, run and analyze assay data with our complete suite of software products. Mitochondrial function and glycolysis play critical roles in a variety of cellular processes, including cellular activation, proliferation, differentiation, cell death, and disease progression. Discover how real-time, live cell analysis can provide a complete picture of what's driving your cells' phenotype and function. Cancer cells reprogram their metabolism in order to generate the energy and building blocks they need to proliferate. Agilent Seahorse XF technology provides a window into the Warburg effect, fuel usage and other events that drive tumor cell biology. Learn more about Glycolysis and how to study the Warburg effect. Immunometabolism has emerged as a crucial component to understand the connection between metabolic pathways and immune responses. Seahorse XF Technology enables researchers to understand and perturb immune activation and response in real-time through metabolic measurements. From target identification and validation, to toxicology, and mechanism of action, being able to collect direct measurements of cell and energy metabolism will allow you to expand your drug discovery pipeline by targeting metabolic pathways, assessing compounds for mitochondrial toxicity, and better understanding their mechanisms. Research into metabolic profiles and changes is enabling insight into browning, substrate and nutrient utilization, and inflammation. Agilent Seahorse XF technology provides the capability to examine functional metabolism in models of cellular metabolic syndromes. Researchers are using Agilent Seahorse XF technology to explore metabolic changes in neuronal systems, using live cells, in real-time, requiring less biological samples than traditional assays. Metabolic shift in induced pluripotent stem cells (iPSCs), has a significant importance in establishing pluripotent identity. Using Agilent Seahorse XF technology, researchers can predict the ability of somatic cell reprogramming to iPSCs, and how PSCs alter their metabolism during the differentiation process to terminally differentiated cells. Core Facilities with Seahorse XF Research Services. Cell Analysis Travel Awards for graduate students and young investigators. Seahorse Grant Expeditor Package can simplify your grant application process.